Nathalie Du Pasquier: Untitled, 2007. Nathalie Du Pasquier’s compositions transform the interiors of the International Centre of Graphic Arts into a series of immersive microenvironments, sampling from over three decades of the artist’s paintings, prints, drawings and mural, as well as a new series of silkscreen prints made on site at the MGLC. Du Pasquier first made her name with vibrant, eye-catching graphics and textile prints shaped by the artist’s eclectic influences, boundless imagination and impulse towards experimentation. Since the late 1980s, she has focused primarily on painting, building up a tremendous body of work, much of which has yet to be exhibited publicly. Fair Game shuns a chronological ordering in favor of forging more intuitive formal affinities between the various series. Assorted elements or objects appear and reappear in different compositional configurations, like a card in a deck that takes on new powers and limitations with each hand dealt. This visual vocabulary is distilled in a new series of silkscreen printed modules – “virtual furniture,” as the artist calls it – produced in the MGLC’s print studio. Nathalie Du Pasquier was born in Bordeaux, France in 1957, but moved to Milan in 1979. She worked there as a designer, becoming one of the founding members of the Memphis Group. In 1987, she shifted from her emphasis on the “decorated surfaces” of graphics and textile prints to focus on painting. Du Pasquier’s work has been the subject of numerous solo exhibitions at international institutions, including the landmark Big Objects Not Always Silent, curated by Luca Lo Pinto for Kunsthalle Wien in 2016. She lives and works in Milan. 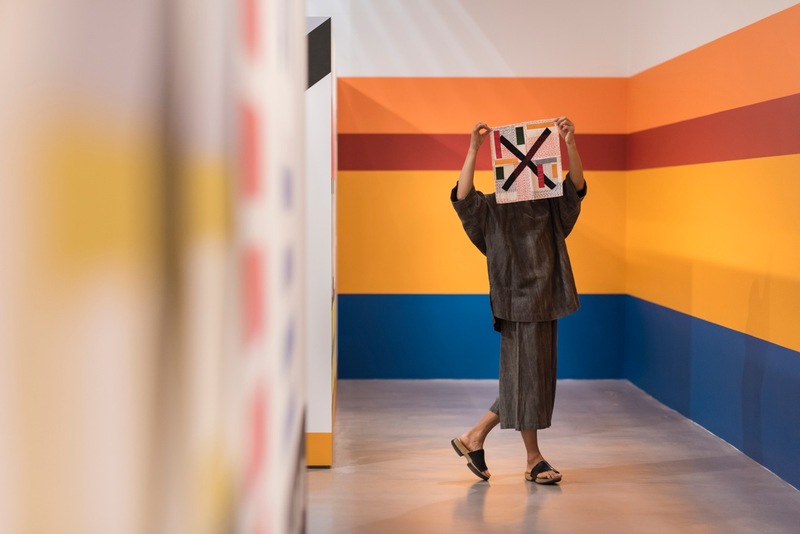 The Korean dancer Yong Min Cho will carry out a dance intervention at the Fair Game exhibition based on the language of the body, setting up and articulating unusual and new trajectories among the individual artworks. Nathalie Du Pasquier has designed and selected some of the accessories that will be used in the performance by Yong Min Cho. These include graphic pieces reminiscent of road signs. And it is precisely these signs that have inspired the title Tutte le Direzioni – taken from an Italian road sign, which indicates the way leading in all directions. Studied Architecture in South Korea, Scenography at the Brera Academy of Fine Art, Milan and Dance at the Civica Scuola di Teatro Paolo Grassi in Milan. Then he moved to Venice to work with Carolyn Carlson at the Accademia Isola Danza and as an independent dancer at the Centro Teatrale di Ricerca Venezia. Since 2005, he has been living and working in London realising projects in the UK, Europe and South Korea. During 2014 he was artist/choreographer in residence at Asia House London. (Camden Arts Center: September 2017 - January 2018). Photo by: Camden Arts Centre.